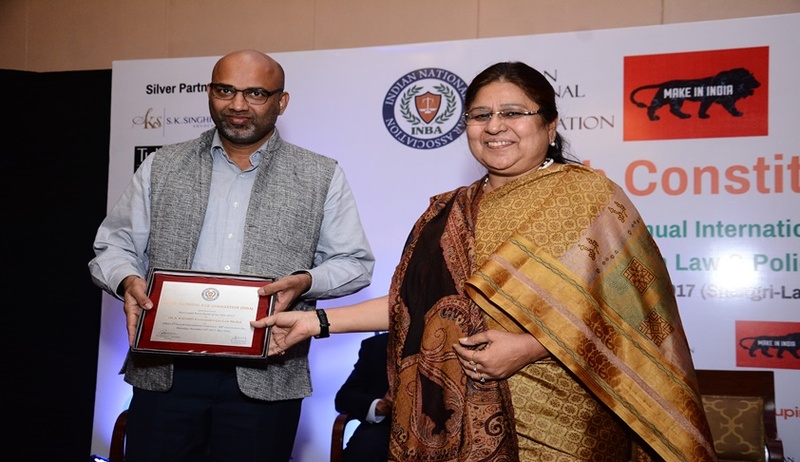 To coincide with the 68th Indian Constitution Day celebrations, the Indian National Bar Association (INBA) hosted its 6th Annual International Conference titled ‘68th Constitution Day’ at The Shangri-La, Eros Hotel, New Delhi, on November 25. The annual event this year attracted over 400 dignitaries, leaders, researches, advocates, practitioners, government officials, policy makers, CEOs, general counsels and heads of the legal department of various MNCs and Indian companies. The attendance at the event drew participants from at least eight countries and four continents. The 2017 edition of INBA’s annual international conference brought together over 30 speakers from some of today's leading organisations -- both national and international. Through keynote sessions, panel discussions and roundtables, the event offered an array of inspiration, insight and insider tips that enabled attendees to increase their influence across their company's decision-making processes. The INBA got the patronage of the Department of Industrial Policy & Promotion (DIPP) Ministry of Commerce and Industry, Government of India, to exhibit the ‘Make in India’ logo of the lion, which is now synonymous with India for making it an international destination for investment by all concerned, as also the StartUp India & Digital India logos. The keynote address was delivered by Leidylin Contreras, Deputy Director, Directorate of Foreign Trade, Ministry of Industry and Commerce, Dominican Republic, and Chief Justice of New South Wales Thomas Frederick Bathurst, AC. Kaviraj Singh, INBA secretary-general, while giving the vote of thanks at the inaugural highlighted the activities of the Indian National Bar Association. S Ramaswamy, chairperson of the general counsel section of INBA, read out the Preamble of the Constitution of India in remembrance ‘to prompt us to reflect upon and renew our pledge to protect, preserve and enhance the values enshrined in our Constitution’. The inauguration was followed by a book launch of State of Women Entrepreneurship in India by advocate Kanchan Khatana. Contribution in the legal field from Corporate Sector- S Ramaswamy, Founder, Medha Advisors & Chair, General Counsel Section, INBA. Women Lawyer of the Year - Namita Chadha, Founder and Managing Partner, Chadha & Co.